Is it bad to eat at night? Eating late in the evening or at night can be bad for your health...here's why. 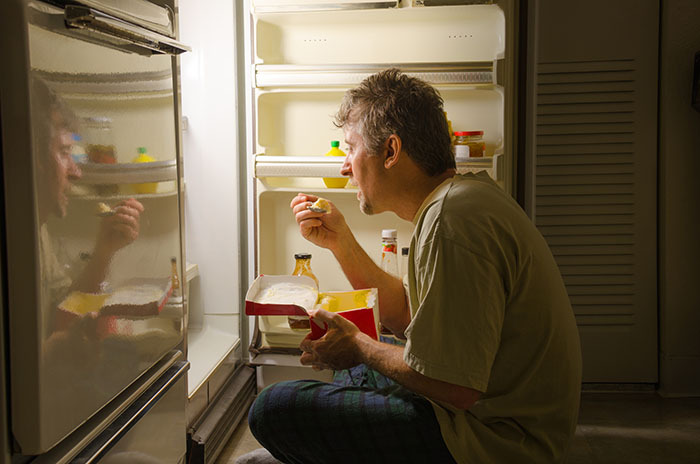 Eating late at night can result in elevated triglycerides and cholesterol levels, weight gain, and other issues. And for women, a recent study found that those with early-stage breast cancer are less likely to have their cancer return if they fast for 13 hours every night. Late-night meals and midnight snacks aren’t uncommon. Whether you get home late from work and have to eat dinner when you’re usually going to bed, watch a movie late and snack on popcorn, or feel the need to graze on food to stay awake on a late study night, there’s a temptation to eat during the nighttime hours. Is this harmless, or is it bad to eat at night? Science consistently has told us it’s an unhealthy habit. Why Is It Bad to Eat at Night? Our bodies have a circadian rhythm: a 24-hour cycle that affects everything from our energy levels and metabolism to the way our organs function. We are wired to be awake and to eat during the day, and to sleep at night, when it is dark. But if we alter our natural rhythm by working night shift, being exposed to light at night, or eating at night (particularly junk food), it can interfere with normal circadian function. [1,2] A host of negative changes can occur in the body particularly when we eat at night. Altered hormone function. Eating at night alters levels of insulin, glucagon, and leptin. When people eat more in the evening, they have higher markers of inflammation. In one study, for each 10 percent increase in the proportion of total calories consumed between 5 pm and midnight, there was a 3 percent increase in C-Reactive protein, a major marker of inflammation in the body. Impairments in blood sugar regulation. Our body’s ability to use insulin to control blood sugar changes throughout the day, and it is least efficient at night. Glucose levels after meals are highest when meals are consumed late in the day. Shift workers show decreased blood sugar control when eating food at night. 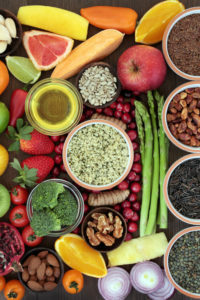 Researchers suggest avoiding meals with a high-glycemic index in the evening to avoid the negative effects and increased disease risk associated with high blood sugar. Weight gain. Human studies have shown that when we eat a significant portion of our total food intake in the evening, we are more likely to be obese. One reason for this may be that there are regulatory elements for the circadian clock in our fat tissues, and disrupting those elements can lead to impaired fat storage. Eating at night can also increase the total amount of food you eat each day, leading to more weight gain. Elevated triglycerides and cholesterol. Eating out of sync with our circadian rhythm can impact the way the body metabolizes lipids. This can lead to increased levels of both triglycerides and cholesterol. Read more about the link between nighttime eating and elevated lipid levels here. Impaired memory. Recent research suggests that our memory can be affected by eating at night. Researchers found that mice who were fed meals during the time they should have been sleeping experienced deficits in learning and memory. To avoid the negative effects of eating at night, eat dinner as early in the evening as your schedule allows. If you feel hungry later in the evening and need a snack, choose a small, high-protein snack like nuts instead of something carbohydrate-heavy. Avoid large meals within a few hours of your bedtime. If you have to be awake at night, as with shift work, try to stick as close to regular mealtimes as possible. To read about some of the health risks associated with shift work, as well as tips for how to reduce your risk, read 6 Dangerous Effects of Working Night Shift. What are your tips for avoiding eating late in the evenings or at night? Have you ever noticed that your health takes a toll when you eat a lot late in the day? Is it bad to eat at night? Please share your thoughts in the comments section below. Proc Natl Acad Sci U S A. 2014 Nov 25;111(47):16647-53. PLoS One. 2015 Aug 25;10(8):e0136240. Br J Nutr. 2012 Oct;108(7):1286-91. Elife. 2015 Dec 10;4. pii: e09460. Originally posted in 2016, this article is regularly updated. blood sugar, blood sugar control, c reactive protein, calories, cholesterol, control blood sugar, effects of working night shift, food, glucose, glucose levels, Glycemic index, health, high blood sugar, high glycemic, high glycemic index, hormone, inflammation, insulin, is it bad to eat at night, leptin, markers of inflammation, memory, metabolism, nuts, protein, sleep, sugar, Triglycerides, weight gain. Wow this article an eye opener, thank you that it was free. I do not like to eat, it’s a necessity. Since my husband passed I have been putting off eating til late. But this article will change that. Several issues mentioned def a problem for me, maybe all of them. I hsve to hsve blood workup tom. So will be sure to inform my Dr. About this bec first time having it since he passed. Sure don’t want her to think needs to put me on more Meds. I would like to take less. Thank you again, might give another report in a few months as to changes I experience. “Mice who were fed meals during the time they should have been sleeping experienced deficits in learning and memory”? This has nothing to do with food! Of course humans retain less memory if their sleeping cardiac cycle is broken by being suddenly awakened. Nevertheless, why the hell would you use this as an evidence of “eating at night” being unhealthy? Simply say staying awake at night is unhealthy and don’t spread unnecessary lies. I’m 11weeks pregnant and I get hungry in the middle of the night.